This fantastic Progress air fryer is the healthy way to cook all your favourite foods with little or no oil. 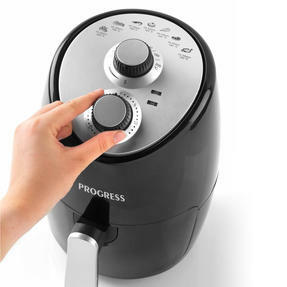 Convenient to operate with a 30 minute timer, adjustable temperature settings and power and ready indicator lights, the unit circulates hot air throughout the chamber for rapid cooking results. 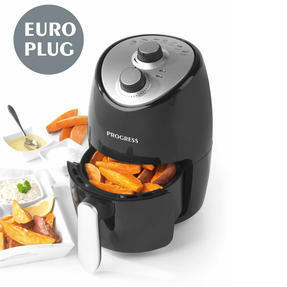 An innovative alternative to a deep fat frying, the 1000 W fryer has a generous 2 L capacity with a removable non-stick cooking rack which makes food easy to serve and the fryer easy to clean. 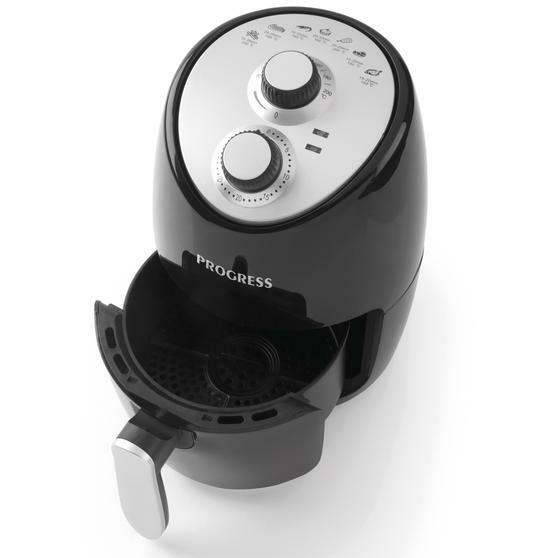 A healthier alternative to deep fat frying, this Progress air fryer enables you to cook using little or no oil without losing flavour. With 1000 W of power, the fryer can heat up to 200° and uses rapid heat circulation in order to cook your food incredibly quickly. Ideal for home-made chips as well as steak, fried chicken and roast vegetables, this space-saving unit cooks a wide variety of meals. The compact unit preheats in just 5 minutes and has a 30 minute timer, variable temperature control and an automatic shutoff function. It contains a removable and easy-to-clean 2 litre cooking basket which enables you to quickly serve your food straight after cooking.